quarto, 4 pages, including stamp-less address leaf, two small holes in second leaf due to careless opening affecting several words of text, else in very good, legible condition. 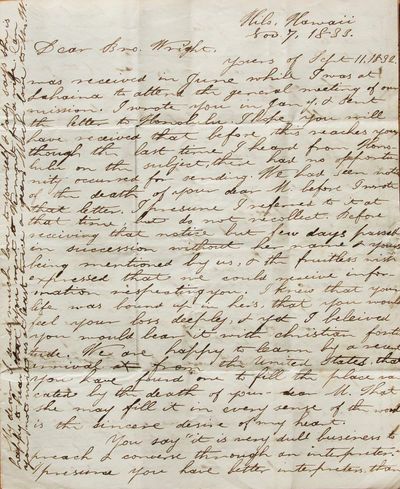 A very interesting letter from David Belden Lyman, Hawaiian missionary, to his friend, and fellow missionary, Asher Wright, a missionary to the Seneca Nation, near Buffalo, in New York State. The letter discusses affairs at the Hilo Mission in Hawaii, the respective difficulties of preaching in and learning the languages of their charges. Lyman describes the methods that he and his fellow missionaries used to learn the Hawaiian language. You say "it is very dull business to preach & converse through an interpreter." I presume you have better interpreters than can be obtained here. There is probably not a man on the Islands, the missionaries excepted, certainly there is no native competent to act as an interpreter. I believe none but the pioneers & members of the first reinforcement have ever preached through an interpreter. Your circumstances, however, are different. It is a great labor to begin to preach in Seneca. Whereas the man who devotes himself to the acquisition of this language may begin to preach in it within 3 or 4 months. At the end of 5 months he may write a sermon in two weeks, or even less perhaps, which will be better than any sermon delivered through an interpreter. I have written only 25 native sermons, some the brethren who sailed with me have written more. You know that I always wrote slowly a very large share of my time has been occupied, also, in schools &c &c. I have preached in native about 120 times & ten or 12 times in English since my arrival at these Islands. Our mode of learning the language is to depend almost entirely on conversing with natives & on writing in their language, having an intelligent native one, however, who knows not a word of any language but his own to correct our compositions. We have received but very few lessons from our elder brethren, & from books, compared with what we expected, we have received no assistance. Most of the elder missionaries have a partial vocabulary of the language which they have made out, each one for himself. It is but a very small assistance, however, in acquiring the language. I think it probable a number of years will yet elapse before any vocabulary or Grammar will be ready for the press. It is certain that any Vocabulary which can, at present, be made would be but a trifling assistance in learning the language. I say this because the language it must be learned not by the eye but the ear. Just so far as it is learned by the eye one will be unable to understand conversation or to converse you must not suppose from what I have said that it is an easy matter to acquire the language & make books [in] this [lan]guage. The difficulty is great [and] it arises in a great measure from its barrenness of the language.The natives have had but few thoughts on subjects of importance, consequently they have no language to express thoughts on such subjects. Pardon me for saying so much respecting ourselves. I did it not to make ourselves the heroes of my story, but to give you some idea of the mode of study which we pursue. – Our health has been as good as we had any reason to expect it to be. Bro. S's health has been better here than when in the Sem. That of his wife has been uniformly very poor. You ask, "Have you had any addition to the numerical strength of your mission since you left N. E.?" I answer yes, a large addition. Of the 9 couple who came in the Sveric, 7 are now parents. We have been permitted to pursue our labours without any interruptions of that sort. Dr. & Mrs. Chapin have no children, they have been with us about two months leave today. Her health is & has been very poor. The Dr. was called here to attend on Mrs. D. on the birth of her second daughter, & has had no opportunity to return. – A dark cloud still hangs over this mission. Nothing but the influences of the Holy Spirit [can] dispel it. Pray for us. I have not seen Cr Diell. I wrote him some months since but have received no answer. He is much occupied with building &c in addition to his other labors. I had almost forgotten to say that Mr. Goodrich's health is poor, & that he thinks of returning to America. David Belden Lyman, (1803-1884) was an early American missionary to Hawaii who opened a boarding school for Hawaiians in Hilo. His wife Sarah Joiner Lyman (1805-1885) taught at the school and kept an important journal. They had several notable descendants. David Belden Lyman was born on July 28, 1803, in New Hartford, Connecticut. He attended Lenox Academy and Williams College from 1824 to 1828. He then went to Andover Seminary and graduated and was ordained on November 2, 1831. He married Sarah Joiner, of Royalton, Vermont, on November 2, 1831, and on November 3rd they sailed from Boston in the fifth company of missionaries from the American Board of Commissioners for Foreign Missions to Hawaii. They reached Honolulu in May 1832. They were assigned to work at the mission in Hilo, then one of the remotest in the islands, under Reverend Joseph Goodrich. The Scottish botanist and explorer David Douglas stayed with the Lymans between his historic climb to the summit of Mauna Loa, and his death exploring Mauna Kea in 1834. Sarah Lyman recorded earthquakes felt in Hilo and volcanic eruptions of Kilauea and Mauna Loa. It has been used as a record on the frequency and strength of tremors by subsequent researchers. Her journal kept between 1833 and her death in 1885 is a valuable record of life in Hawaii. Titus Coan and his wife Fidelia arrived in 1836 and officially took over preaching duties at the Hilo church. However, Rev. Coan was often traveling through nearby districts, and Lyman continued to run the church during these trips. Lorrin Andrews had established the Lahainaluna Seminary in 1831, but primary and secondary schools were also needed on each island. The small school that had operated since 1828 in Hilo could only handle about 60-70 students. The Lymans founded the Hilo Boarding School in 1836 with a grant of $ 500. After the first year, only $ 140 of the grant was spent on two grass huts for only about 12 boarders. By 1837, six graduates were sent to the seminary and the school continued to expand. In 1838, the students were put to work on another project, building a new wood-frame building for the school and a house for the Lyman family. Mrs. Lyman opened a school for girls in 1839. Students tended a garden to grow their own food, and to raise some cash crops to support expenses. By 1840 thousands of pounds of sugar and molasses were being produced each year. In 1846, King Kamehameha III granted the school water rights to the Wailuku River. In 1848 the school was officially incorporated, and was granted property of 40 acres. Dr. Charles Wetmore became the first doctor in Hilo and taught some classes at the school, moving in to the former house of the Lymans. By 1849 the Lahaina seminary became a government public school (as it is today), and the Hilo school shifted its emphasis to educating teachers and other vocations. The Lymans enforced strict discipline, dismissing students at a high rate because of the large demand to be admitted. However, the native population kept declining due to epidemics and emigration. In 1853, despite Lyman's protest, instruction in the English language was added to that in the Hawaiian language. On November 2, 1853, the school and church were destroyed by a fire. There were no deaths and only one serious injury, arson was suspected. Local businessmen raised funds to rebuild, aided by an appropriation from the Hawaiian Legislature. The third and final school campus opened in 1856. Lyman retired as head of the school in 1873. He died in 1884 in Hilo. Lyman's correspondent Rev. Asher Wright, began his missionary work to the Seneca Indians on November 9, 1831, residing in the Buffalo Creek Reservation. The mission settlement was located near the current border of West Seneca and South Buffalo, all of which was then part of the reservation. Rev. Wright was both a physician and minister, and along with his wife Laura, worked among the Seneca for 44 years, moving to the Cattaraugus Reservation after the Compromise Treaty of 1842 and subsequent sale of the Buffalo Creek Reservation lands. Becoming fluent in the Seneca language, Rev. and Mrs. Wright also spent much time on horseback, riding the trails to visit and assist the Senecas living in what was to become the Town of West Seneca. Historically Significant Collection of Letters written by a Mormon convert detailing life in Nauvoo, Illinois, the construction of the Mormon Temple, the period leading up to the murders of Joseph and Hyrum Smith, as well as the aftermath. The letters describe “Winter Quarters” in Nebraska, 1846-1848, the journey to Salt Lake City in 1848, and the early days and establishment of the Mormon settlement there, the erection of the Temple, Indian hostilities, the Hand-cart Pioneers, and the Mormon War of 1857-1858. The letters date 1842 – 1859.